Unique medium-heavy duty kingpinless design eliminated problems associated with kingpin failure due to severe shock loading. Dual ball bearing raceway absorbs load and thrust to provide superior shock loading capabilities. 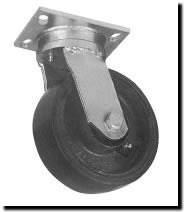 Options are available for medium duty kingpinless casters to increase the ease of maintenance and performance of the caster. Bearing options are available, and can increase the performance of the caster when properly matched to a specific application or use. Rubber on Steel 400 NCC-KP30S420-RSR 6.16 "
Rubber on Aluminum 400 NCC-KP30S420-RAR 5.06 "
4" 2 Rubber on Polyolefin 350 NCC-KP30S420-TPRR 3.96 "
Polyurethane on Polyolefin 700 NCC-KP30S420-PPUR 3.96 "
Polyurethane on Steel 700 NCC-KP30S420-PUR 6.16 "
Solid Polyurethane 700 NCC-KP30S420-SPUR 3.96 "
Polyurethane on Aluminum 700 NCC-KP30S420-PAR 5.06 "
EZ Rolling Polyurethane on Steel 700 NCC-KP30S420-EZPUR 6.75 "
Semi Steel 1000 NCC-KP30S420-SSR 5.72 "
Heavy Duty Steel 900 NCC-KP30S420-SSR-HD 6.72 "
4" 2 EZ Rolling Steel 800 NCC-KP30S420-CDSR 7.05 "
V Groove 800 NCC-KP30S420-VGR 6.71 "
Polyolefin 500 NCC-KP30S420-POR 5.06 "
Phenolic 800 NCC-KP30S420-PHR 5.25 "
High Temp Phenolic 800 NCC-KP30S420-PHR-HT 5.25 "
Rubber on Aluminum 500 NCC-KP30S520-RAR 5.75 "
Rubber on Polyolefin 375 NCC-KP30S520-TPRR 4.62 "
Polyurethane on Polyolefin 750 NCC-KP30S520-PPUR 4.62 "
Polyurethane on Steel 1000 NCC-KP30S520-PUR 6.60 "
Solid Polyurethane 1000 NCC-KP30S520-SPUR 4.62 "
Polyurethane on Aluminum 1000 NCC-KP30S520-PAR 5.28 "
5" 2 Cushion Polyurethane on Polyolefin 750 6-1/2 NCC-KP30S520-SCR 4.62 "
EZ Rolling Polyurethane on Steel 1200 NCC-KP30S520-EZPUR 7.00 "
Semi Steel 1000 NCC-KP30S520-SSR 7.92 "
Heavy Duty Steel 1200 NCC-KP30S520-SSR-HD 9.00 "
EZ Rolling Steel 1200 NCC-KP30S520-CDSR 9.00 "
V Groove 1100 NCC-KP30S520-VGR 8.58 "
Polyolefin 650 NCC-KP30S520-POR 4.62 "
Phenolic 1000 NCC-KP30S520-PHR 5.75 "
Rubber on Steel 450 NCC-KP30S620-RSR 7.70 "
Rubber on Aluminum 550 NCC-KP30S620-RAR 6.50 "
Rubber on Polyolefin 400 NCC-KP30S620-TPRR 5.06 "
Polyurethane on Polyolefin 900 NCC-KP30S620-PPUR 5.06 "
Polyurethane on Steel 1200 NCC-KP30S620-PUR 8.58 "
Solid Polyurethane 1200 NCC-KP30S620-SPUR 5.06 "
Polyurethane on Aluminum 1200 NCC-KP30S620-PAR 6.00 "
6" 2 Cushion Polyurethane on Polyolefin 900 7-1/2 NCC-KP30S620-SCR 5.06 "
EZ Rolling Polyurethane on Steel 1200 NCC-KP30S620-EZPUR 9.00 "
Semi Steel 1400 NCC-KP30S620-SSR 8.58 "
Heavy Duty Steel 1200 NCC-KP30S620-SSR-HD 9.60 "
Ductile Steel 1400 NCC-KP30S620-DSR 9.60 "
EZ Rolling Steel 1200 NCC-KP30S620-CDSR 9.60 "
V Groove 1200 NCC-KP30S620-VGR 10.12 "
Polyolefin 700 NCC-KP30S620-POR 5.06 "
Phenolic 1200 NCC-KP30S620-PHR 7.50 "
High Temp Phenolic 1200 NCC-KP30S620-PHR-HT 7.50 "
Rubber on Steel 500 NCC-KP30S820-RSR 9.68 "
Rubber on Aluminum 550 NCC-KP30S820-RAR 7.50 "
Rubber on Polyolefin 500 NCC-KP30S820-TPRR 5.50 "
Polyurethane on Polyolefin 900 NCC-KP30S820-PPUR 5.50 "
Polyurethane on Steel 1400 NCC-KP30S820-PUR 12.10 "
Solid Polyurethane 1400 NCC-KP30S820-SPUR 5.50 "
Polyurethane on Aluminum 1400 NCC-KP30S820-PAR 5.50 "
8" 2 Cushion Polyurethane on Polyolefin 900 9-1/2 NCC-KP30S820-SCR 5.50 "
EZ Rolling Polyurethane on Steel 1200 NCC-KP30S820-EZPUR 13.10 "
Semi Steel 1400 NCC-KP30S820-SSR 12.10 "
Heavy Duty Steel 1200 NCC-KP30S820-SSR-HD 13.10 "
Ductile Steel 1400 NCC-KP30S820-DSR 13.10 "
EZ Rolling Steel 1200 NCC-KP30S820-CDSR 13.10 "
V Groove 1200 NCC-KP30S820-VGR 14.74 "
Polyolefin 900 NCC-KP30S820-POR 5.50 "
Phenolic 1400 NCC-KP30S820-PHR 7.75 "